I have warmly welcomed several recent Melodiya issues of late. The Russian label has been mining its back-list, re-mastering recordings and issuing them in a natty new digipack format. This copies the DG Original CD retro design making them look like LPs. The result is very attractive. 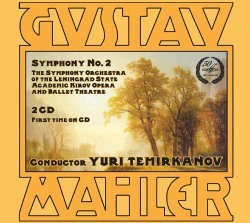 This latest Mahler 2-CD set is not in fact a re-issue but labelled “First Time on CD”. Almost anything by the eminent Russian conductor Yuri Temirkanov is worth hearing, but in a very crowded field a “new” recording of the “Resurrection” has to earn its place. That's especially true of one that is thirty-five years old in decent but indifferent analogue sound. It is spread over two CDs when it could surely have been squeezed onto one. The booklet fails to provide the sung text. My first impressions did not convince me that it could merit recommendation. The sound quality has a rather thin, shallow, slightly tinny ambience, with shrill strings, some coarse, blatty orchestral playing in general and approximate tuning from the woodwind. I also had my doubts whether the Russian forces here were sufficiently attuned to the Mahlerian idiom. However, that was before I had re-listened several times and fully appreciated the best of this recording. This comes towards the end; in fact the conclusion, from “Aufersteh’n” onwards and is amongst the very best in my fairly extensive collection of this symphony. As an interpretation, Temirkanov is more in the world of Klemperer than Levine, Tennstedt or Bernstein. This is a fierce, driven account, similar in tempi to Klemperer’s live and studio versions but without his flexibility or his ability to generate weight of utterance. The opening movement at times borders on the prosaic. Indeed, for me, this first movement is the weakest of the five. There is little sense of cosmic space because the prevailing mood is so unremittingly tense and taut. The ascending string figure at 2:28 fails to expand and although it is marginally more expansive on its re-appearance at 5:24, those two potentially great moments smack here of opportunities lost. The over-exuberance of the brass reminds me of Strauss’s famous dictum about never looking at the horns as it only encourages them. Despite their enthusiasm, there is little sense of terror or occasion surrounding the fortissimo chords at 13:40. They are simply noisy - yet the scurrying descent of the last few bars is thrillingly executed. The Andante moderato is nicely played, even if it lacks some lilt, charm and refinement. That said, the violas play their melodic line exquisitely. The “St Anthony preaching to the fishes” movement is similarly pleasing without catching the wicked humour or biting irony of the music. It’s a bit po-faced, goes a little slack in the slower middle section and the climax at 9:26 is decidedly leaden-footed. By this stage you might conclude that this recording is a non-starter, given the competition but this where things start to look up. Despite my reservations about the decidedly unidiomatic German of the two soloists, including the Süddeutsch pronunciation of “Röschen” with a soft “sh”, they both have gorgeous voices. Thus, the brief “Urlicht” makes its mark and the soprano’s contribution to the final movement is simply outstanding. Her big, vibrant voice soars ecstatically over the massed sound. The choir too, is a Russian treasure of the kind which recently thrilled the audience when Gergiev conducted Boris Godunov at the Barbican, where a relatively small chorus lifted the roof. This is just as well, as the Last Trump preceding the choir’s entry is a rather low-key affair. It is surprising that a conductor who can make such an impact with the Dies Irae in his recording of Verdi’s Requiem can settle for the mild cataclysm we hear at 14:03. From 20:37 on, however, we are in another world as the combined forces change up a gear; real transcendence is achieved in those last thirteen minutes. It may well be that the limitations of what precedes this electrifying apotheosis disqualify this recording from being truly recommendable but I know I want to keep it on my shelves if only for the way it delivers one of the great climaxes in Mahler’s oeuvre. Oddly, neither an exact recording date beyond 1980 nor a location is given. Presumably it was recorded in the Concert Hall of the Mariinsky (formerly Kirov) Theatre.